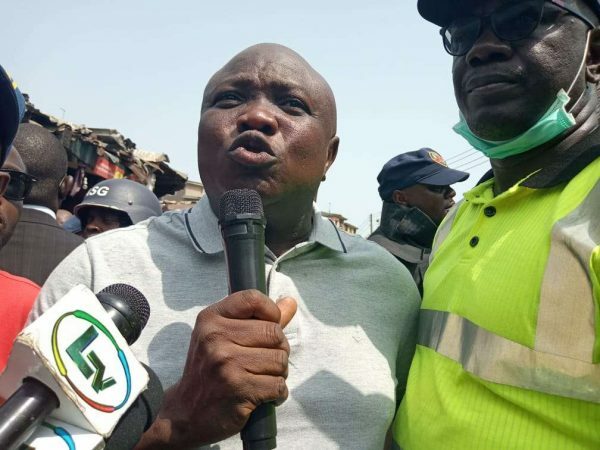 According to Punch Metro, the governor of Lagos State, Akinwumnu Ambode has arrived the scene of the building collapse on Lagos Island where over 100 school pupils are reportedly trapped. The Governor, who came in at exactly 2:45pm, said from the briefing he got from the Lagos State Emergency Management Agency boss, 25 bodies have been rescued so far. He said, “I’ve been briefed that the building is a residential building accommodating an illegal school on the second floor. He, however, said the state government will carry out an integrity test on buildings around the area and demolish and any that fails the test. “We have been receiving pleas from house owners from the area. Notwithstanding, we will go ahead with the integrity test and any building that fails the integrity test will be demolished. “But the most important thing now is to save more lives before we talk about dealing with the culprit. “The deputy governor is at the hospital to take care of those who have been rescued and are at the hospital. The hospital bills will be taken care of by the state government,” Ambode said.